Russia does not manufacture a single "top notch engine" in this class. If China could access something like F414 or EJ200, that's another story. The end goal is to use everything Chinese including engines and at the moment, the RD-33 variants may be better than WS-13 (what China currently has in this class) and this engine is available for China because Russians know China has WS-13 variants already and WS-19 project. They haven't inducted the J-31 because it is still in prototype phase. Haven't done any weapons testing or fitting out as far as we know. The engines (even the Chinese ones) are much further ahead than the rest of the plane. Question 3 doesn't make sense to me. Are you referring to WS-19? As in the final engine expected for this fighter? Because two different engine types are available for this fighter today. It's the rest of the fighter that is not ready yet. Russia hasn't in the past, and their only unavailable military turbofan is the IZD.30 which wouldn't fit in the J-31 anyway nor were they designed to. Russia hasn't even denied RD-93 sales to Pakistan for JF-17s. Why would they deny RD-33x to China for J-31? BTW I'm not a "senior member" but your questions are simple enough to answer so I had a go. I hate to say I told you so, but J15 is too big and heavy causing two fatal accidents. So would the J20. J31 is smaller and better fit. End of Story. F-14 is nearly 20m long and weighs more than the F-22 (F-14D). But it served the USN very well including actual combat. 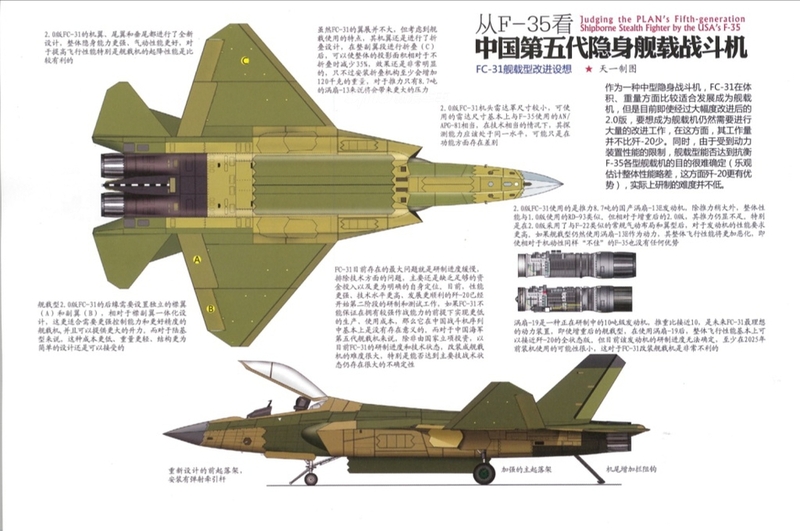 We cannot write-off the J-15 until we see the attrition rate of the CATOBAR capable J-15 (J-15T?). N00813 and ougoah like this. Cost management is a very big part of force planning. It is not only about minimising costs, but also maximising combat readiness in a wartime situation. Imagine a situation where a battle-damaged J-20 has landed and needs engine replacement but the only engines available are WS-13s because the WS-15 shed was just bombed and the highway is blocked by a landslide, or where they are trying to identify a difficult problem with a J-31 engine using J-20 techs because the J-31 techs are dead from enemy fire. Using a single engine makes inventory and personnel management easier which in turn allows for more redundancy and therefore a more robust capability that is more resistant to wartime losses. In a real war, lots of stuff goes wrong and victory is in significant part about which "system of systems" can continue functioning in a such a degraded state. Ali Qizilbash, Duran, N00813 and 1 other person like this. It is not just about cost management, but about inventory management and other critical wartime factors. Imaging a situation where a J-20 has landed and needs engine replacement but the only engines available are WS-13s, or where they are trying to identify a difficult problem with a J-31 engine but the qualified techs are dead from enemy fire. The advantages of maintaining a single engine design (as the US did with F-15/16) are very compelling, and this is indeed one of the reasons I do not favour the FC-31 design as a complement to J-20. Having 2 different aircraft rely on the same engine model can also drive down the individual cost of each WS-15 due to economies of scale. Who really knows why J-31 development seems to be slow. The fact remains, this level of progress may be on time, the project could be taking less time than J-20 development for all we know, it just started a lot later than J-20. To conclude that development is slow and must be a result of engine issues etc would be incorrect. WS-13 engines have been ready for years. J-31 isn't ready, its subsystems are also probably far from ready. WS-19 (or whatever eventual engine J-31 is set to use) may be ready when the rest of the plane is. Prototype staging have more to do with what they want to be testing. It's revealing of the development stage they are on and so far it would appear that J-31 is still nowhere near operation level. If PLAN actually has decided on it, maybe the whole project will speed up, maybe not. We'll see. AleDucat and defenceman like this. J-15 or Su-33 and F-14 sized fighter is definitely superior for carrier than something like Mig-29K, F-18. Mig-29K has had more accidents than J-15 (okay yes they've had more operations so chances of failure are greater). Smaller does not mean safer. J-15 FCS could be problematic but that isn't because of its size. F-14 was abandoned due to cost issues with updating the entire fleet. Updated F-14s would have made a FAR superior carrier fighter than roided up F-18s. If they want to improve the safety for large carrier fighters like J-15, they can do so with larger CATOBAR carriers, better carrier designs that specifically accommodate J-15's potential for errors, and better engineering controls. New carrier designs will work on eliminating and substituting the risks while better engineering and admin controls will take care of rest. China's early runs of bullet trains were also far more problematic than they are today, it's just a learning curve. They've only trained and played around with carrier fighters for a couple of years. J-15s are here to stay. We wouldn't have seen twin seat versions and electronic warfare versions if they were iffy about the whole fighter. PLAN will continue to upgrade J-15 types for new generations of electronics and sensors you can bet on that. With better carriers, PLAN will have the longest range, largest payload carrier borne fighter on the planet. Thank you Ukraine and Soviet Union. To match the overwhelming numbers of nearby F-35s will require other pieces of technology. Getting J-31 on the new carriers to counter USN and JMSDF networked warfare will mean PLAN needs both numbers and alternative technologies developed specifically to counter this threat. J-15s and PLAN carriers should only be a fraction of this tool kit if they are to be successful, there is just no way J-15s and J-31s on even a dozen or so PLAN super-carriers can guarantee success. Yodello and AleDucat like this. Readiness isn’t be affected by having two different engines. It’s a function of how much planning and preparation you have done ahead of time. If you need two different engines you will stock each engine to the extent that they reach your readiness requirements. If you don’t have the engines you need on hand that’s a problem with your preparation, not a problem with how many different engines you’re operating. To illustrate this point, in a situation where you’re operating only one engine and your WS-15 shed was bombed you would have no engines, period, unless you had another stockpile of those engines somewhere else. Having a second kind of engine neither makes that situation worse nor prohibits the obvious solution around that kind of situation (have storage redundancies). Wrt technicians, I don’t think there’s such a thing as an engine technician that only knows how to work on one kind of engine. I imagine all technicians who work on engines are trained to deal with multiple kinds, especially since even without a medium thrust fighter engine the PLA has to operate more than one kind of engine. If this is not the case, they should probably change this practice immediately, as having techs that only know how to work on a single engine each would be very poor employment of operational manpower, especially given that there really is nothing that prevents a technician from learning how to work with multiple engines. To argue that we should expect engine technicians in the PLA to each only know how to work with one kind of engine is like saying we should expect car mechanics to each only know how to work on only one kind of car. 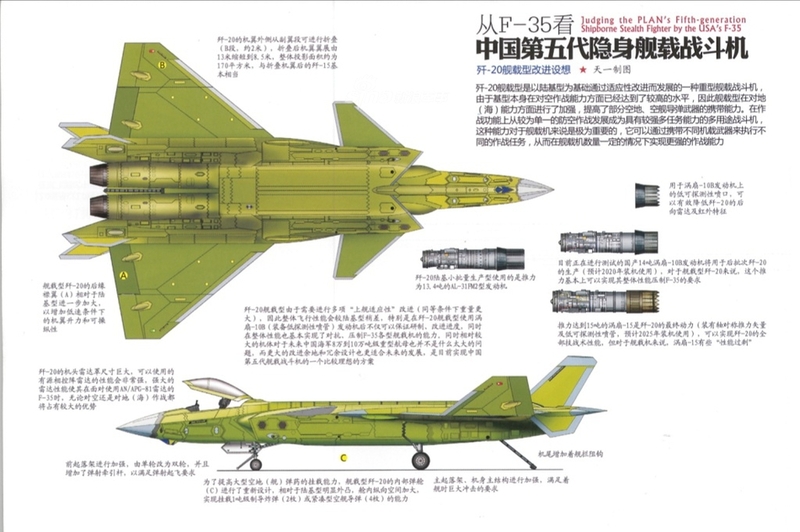 I don’t think, given that, again, even without a medium thrust fighter engine the PLA has to maintain multiple different kinds of engines, that the cost and efficiency savings from not having a medium thrust fighter engine is very significant. 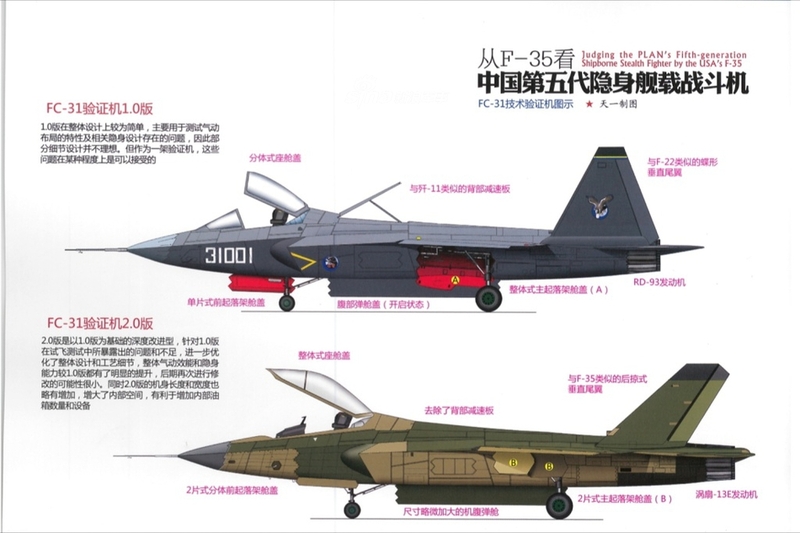 Furthermore, it does seem to appear that, if we’re going by some of their UCAV projects, even without a twin engined medium sized fighter the PLA will need a medium thrust engine anyways. I also question whether on net developing a medium thrust fighter engine will cost more than simply making a single engined fighter that uses WS-15s because if the PLAN really is insisting on having a smaller fighter than the J-20 a single engined WS-15 would require the development of an entirely new stealth fighter from scratch. It may also require a WS-15 that is uprated to match the size of a medium sized carrier stealth fighter and meet thrust requirements for carrier operations, much like how the F135 had to be uprated from the F119. All those possibilities might be more expensive and take more time than simply developing a new medium thrust fighter engine while making do with an interim solution that is already on hand. You can meet basic requirements for a medium sized carrier stealth fighter with RD-93s or WS-13s. You probably couldn’t do the same with AL-31s or WS-10s on a single engined plane, and maybe not even the initial version of the WS-15. Trying to do so may even force unideal compromises in the fighter’s design. *Furthermore* even if the WS-15 were sufficient for the task there would need to be assurances with the WS-15’s reliability for the harsher conditions of naval operations, since engine failure on a single engined fighter is a much bigger headache with carrier fighters at sea. I don’t think when we look at things in detail the logic of having a single engine type fighter force is the straightforward win you guys are making it out to be. 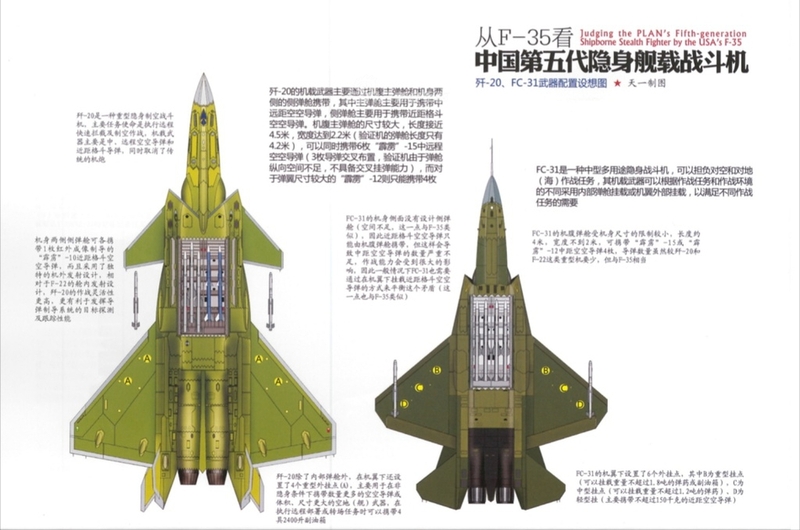 I imagine that the PLAAF by itself will be ordering enough WS-15s for just J-20 production and maintenance, even setting aside other possible (non fighter) projects that might need the engine, that any further efficiencies from scale will probably be minimal. Also keep in mind that if the WS-15’s demand is higher so will it’s production run rate, which will require an expansion of the production line that will have its own associated costs. Unit cost efficiency isn’t just a matter of total orders, but rate of output. A catobar J-15 will be a very interesting development to study. Given that Su-27s were originally designed for the air force and later on modified for STOL ops. The success (it's not a matter of "if it works" rather "when it works") of J-15s for CATOBAR ops, will be a great accomplishment for China and an eye opener for Russia. In a sense, an encouraging sign for the aircraft's versatility. I look forward to the day, where I see the J-15/Su-33 and/or MiG-29Ks take off from steam-catapult assist on Chinese and Russian aircraft carriers. Hyperwarp, LawLeadsToPeace, Yodello and 1 other person like this. bluewater2012, SilentObserver, perfume and 13 others like this.